Jon Paul Kendall Remillard had philosophical difficulties with the concept of Christmas. That the scraggly little evergreen tree his mother was trimming was a midwinter hope symbol was easy enough to understand from the explanations and mental images his mother Teresa offered. But the notion of God creating a body for himself to wear—and even Creation itself—bothered Jack. “Did God become incarnate for aliens? May, Julian (2011-04-27). 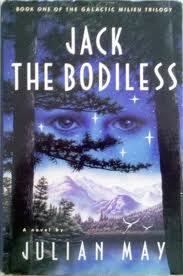 Jack the Bodiless (Galactic Milieu Trilogy) (pp. 268-275). Random House, Inc.. Kindle Edition. This entry was posted in Embracing Doubt and Mature Faith, Ignatian Spirituality, Reason and Faith, Uncategorized and tagged Carl Jung, Catholic, Christian, Christmas, Divine Milieu, Galactic Milieu, Jack Remillard, Jack the Bodiless, Julian May, Noosphere, Pierre Teilhard de Chardin, teilhard, teilhard de chardin, Teresa Remillard, Unity. Bookmark the permalink.